Aachen (Aken in Dutch, Oche in Ripuarian dialect, Aix-la-Chapelle in French ; pop. 257,000) is one of the oldest and most important cities in German history. Founded as a spa town by the Romans, it became the preferred residence of Emperor Charlemagne. In medieval times, Aachen was the (unofficial) capital of the Holy Roman Empire and the crowing place of German kings. Aachen sits right across the border from Belgium and the Netherlands and could be combined with a visit of Maastricht (if you have your own wheels) or Liège (easily reached by train too). The area around Aachen was settled since the Neolithic period. During the Iron Age, Belgic tribes occupied the area, and were defeated by Julius Caesar in 57 BCE. The Romans channeled its sodium- and sulphur-rich hot springs into baths, known as Aquis-Granum (see also Bath in England). The 20-hectare complex was used from the first to the fourth century. A palace was destined to receive the governor of the province or the emperor. The palace and thermae were destroyed during the Germanic invasions. It is from this Latin appellation that the city name has derived. although this is more obvious in some languages than others (e.g. Aquisgrana in Italian, Aquisgrán in Spanish, Aquisgrão in Portuguese, Akwizgran in Polish). The French exonym "Aix" results from the "i" shifting to the front of the "qu" ("Aquis" into "Aiqus"). The German and Dutch names dropped the "i" altogether and replaced the final "s" of Latin by a more Germanic "en". In the 8th century, Pippin the Younger (714-768), ruler of the Franks (dux et princeps Francorum), who was based in nearby Liège, redeveloped the Roman villa in Aquis. 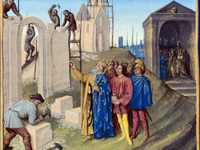 His son, Charlemagne (742-814, known as Karl der Große in German) liked swimming and bathing, which motivated his choice of Aachen, with its the sulfur hot springs, for the construction of his palace. He decided to make it his winter capital, to be able to enjoy the hot springs. From 806, he broke with the Germanic tradition of moving the court along with the circumstances and established himself permanently in Aachen. Charlemagne constructed his palace in the 790's, which he used as his principal residence, as well as for political and religious affairs. The palace was heavily influenced by Roman and Byzantine architectural styles (mosaics, Corinthian capitals, central cupola), and in particular by the Lateran Palace in Rome. It itself served as a model for religious edifices in the empire, such as the Church of Germigny-des-Prés (Loiret, France), the Church of Ottmarsheim (Alsace, France), or Essen Cathedral (North Rhine-Westphalia). The palace, designed by Odo (or Eudes) of Metz, probably used stone salvaged from nearby Roman structures. It consisted of a square of 120x120 meter, divided in four by a north-south and an east-west axis, following the Roman pattern of the town. It comprised a dozen sections, including a tribunal, the treasury, and the thermae. The 1000m² assembly room was in the northern part, and inspired by the Roman aula palatina (now the Basilica) in Trier. The Palatine Chapel was located at the southern end, and was modelled after the 6th-century church of San Vitale in Ravenna. Most of the palace buildings have been destroyed through the ages. 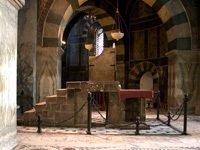 The Palatine Chapel survives at the core of the Aachen Cathedral. Charlemagne founded a so-called Palatine Academy, with nine members, emulating the nine Muses (spiritual guides embodying the arts) of Ancient Greece. It is the ancestor and model for all Western academies. The members were known as the Palatine Counts and spoke only Latin between them. Apart from Charlemagne, the members were Alcuin of York, Ansegise, Adalard of Corbie, Angilbert, Clement of Ireland, Dungal of Ireland, Paul the Deacon, and Theodulphus - six of whom became saints of the Catholic Church (in addition to Charlemagne himself). Aachen had thus become the seat of what would be called the Holy Roman Empire (800-1806), Europe's longest lasting empire, the famed 1000-year Reich. It was also from the split Charlemagne's empire in 843 that the Kingdom of France was born (=> see history of the Franks. Charlemagne spent notably his first Christmas as King of the Franks (768) in Aachen, and also died there in 814. King Ethelwulf of Wessex (795-858), father of Alfred the Great (the first King of England), was born in Aachen during Charlemagne's rule. In 936, Otto I, was crowned king of the Germans in Aachen. He would become the first Holy Roman Emperor properly speaking. From then on, most kings of Germany destined to be emperors of the Holy Roman Empire were crowned "King of the Germans" in Aachen over the next 500 years. The last king to be crowned here was Ferdinand I (of Habsburg) in 1531. Therefore, it could be said that Aachen is to Germany what Reims is to France. Aachen was one of the few free imperial city (i.e. responsible to the emperor only), and this since the earliest times of the Holy Roman Empire. The city was politically too weak to influence the policies of any of its neighbours, but thanks to its proximity to Flanders it achieved a modest position in the trade in woollen cloths. The city of Aachen was surrounded by the Duchy of Jülich to the east and the Duchy of Limburg to the west. In 1372, Aachen became the first coin issuing city in the world to regularly place an Anno Domini date on a general circulation coin, a groschen. A spa was built by the middle of the 17th century, not so much because of the effects of its hot springs on the health of its visitors but since Aachen was then, and remained well into the 19th century, one of the centres of high-level prostitution in Europe. Visitors to Aachen had to wait the end of the 19th century for syphilis to be replaced by rheuma cures. By the middle of the 18th century, industrialization had swept away most of the city's medieval rules of production and commerce. In 1801, Aachen became the administrative centre of the Roer department in Napoleon's Empire. The railway from Cologne to Liège passed through Aachen from 1840. The medieval city walls were abandoned as the limit for constructions in 1875. During World War II, Aachen was destroyed haphazardly, and in some parts completely, mostly by bombing. On 21 October 1944, it became the first German city to be free from Nazi rule. Nowadays, Aachen is no longer an industrial center of major importance. It is, nevertheless, a major centre of IT development in Germany, thanks to the RWTH Aachen University. The RWTH is one of the most prestigious universities in Germany. It was established as Polytechnicum in 1870, and is a centre of technological research of worldwide importance, especially for electrical and mechanical engineering, computer sciences and physics. The FH Aachen, Aachen University of Applied Sciences (AcUAS), and the German Army's Technical School are also located in Aachen. The cathedral of Aachen, frequently referred to as the "Imperial Cathedral" (Kaiserdom in German), was constructed by Charlemagne from 786, making it one of the oldest buildings still in use in Northern Europe. Charlemagne was buried there, and his bones are still preserved in a special shrine. The cathedral obtained its present shape in the course of more than a millennium. 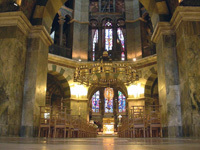 The core of the Aachen cathedral is the Palatine Chapel; being surprisingly small in comparison to the later additions, at the time of its construction it was the largest dome north of the Alps. 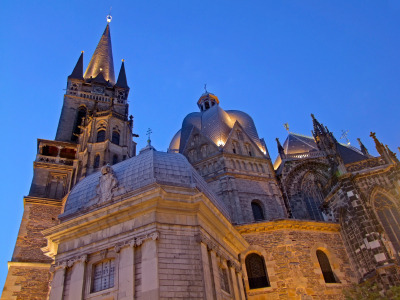 Its fascinating architecture with Classical, Byzantine and Germanic-Franconian elements is the essence of a monumental building of great importance: for 600 years, from 936 to 1531, the Aachen cathedral was the church of coronation for 30 emperors of the Holy Roman Empire. The cathedral has been designated as a UNESCO World Heritage Site. 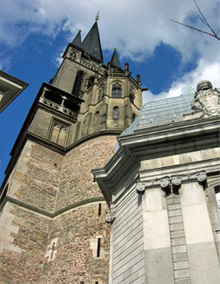 The oldest and most imposing building after the cathedral is the medieval Rathaus (town hall, pictured on the right), erected between 1330 and 1349. It burnt during the great fire of Aachen in 1656, again in 1883, and was severely damaged by Allied bombings in 1943 and 1944. It was painstakingly restored each time. 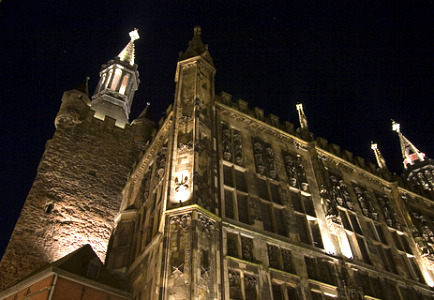 The northern facade is adorned with 50 statues of German rulers, including 31 Kings of Germany crowned in Aachen. The town hall houses a museum displaying replicas of the Imperial Crown Jewels. You can also see the sumptuous 19th-century Rethel frescoes as well as the the town hall's Gothic and Baroque furnishings. The town hall is open every day from 10:00 am to 6:00 pm. Admission is 5 € for adults and 3 € for concessions. One hundred metres east of the cathedral is the Elisenbrunnen (Elisa's fountain), one of the city's famed thermal baths. It was built in the neoclassical style in the 1820's and named after the Prussian crown princess (and later Queen consort) Elisabeth Ludovika of Bavaria (Elise). Following the boulevards that surround the city centre, you will stumble on the remains of the city wall (Ehrenmal). Two old city gates survive to this day: the Ponttor on Rütscher Straße (north-west) and the Marschiertor at the intersection of Boxgraben, Lagerhausstraße and Wallstraße (south). Aachen lies right on the Belgo-Dutch border, at the junction of the E-40 (Cologne-Düren-Aachen-Liège-Brussels-Ghent-Bruges), E-314 (Aachen-Heerlen-Genk-Leuven) and the A44 (from/to Mönchengladbach and Düsseldorf) motorways. By train, Aachen is on the line between Liège (45min) and Cologne (35min to 1h). There are no direct trains to Maastricht; you must go via Heerlen (1h) or via Liège (1h15min). The Thalys bullet train connects Aachen to Cologne (40min), Liège (50min), Brussels (1h35min) and Paris (3h). Aachen is also on the Eurolines coach network.